spent the morning at the barn, then went out for dinner with the fam as none of us are Halloween fans... so we just go out to eat while the shenanigans go on! we had a yummy dinner at Black Bear Diner... that's another place i'll miss when we move back east. 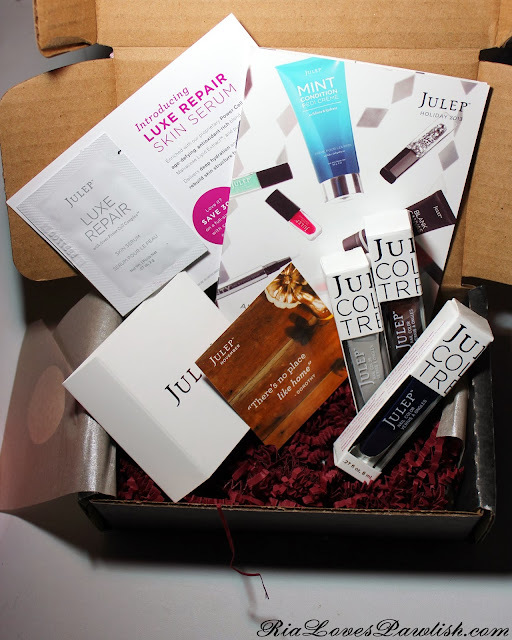 today it's time again to share my Julep Maven box! 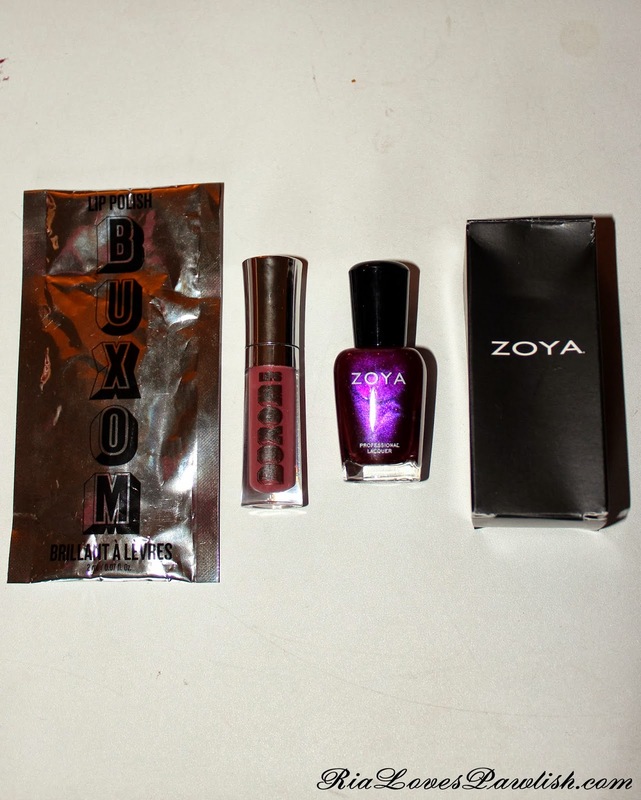 this is the November 2013 It Girl box :) the most exciting polish is Lola, which has a Satin finish... i'm looking forward to checking that out. 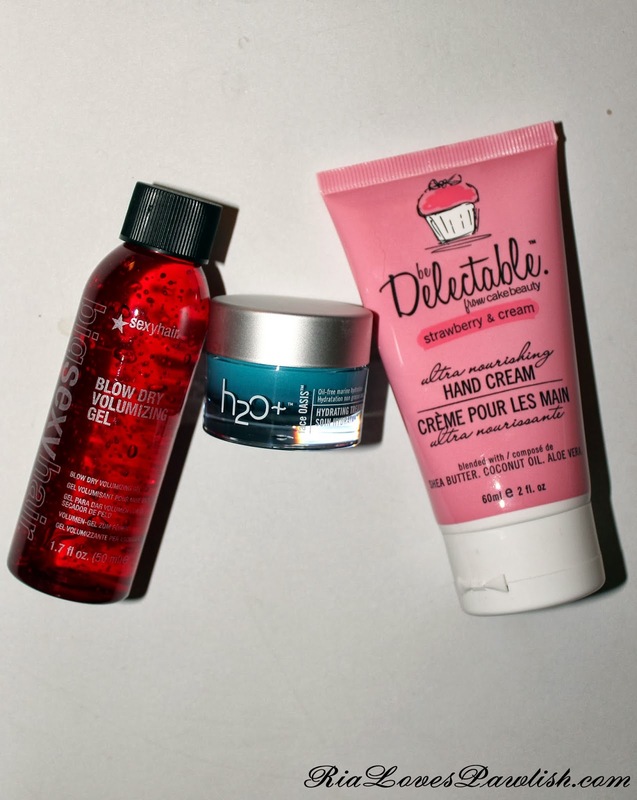 the little extra treatie is a sample of their new Luxe Repair Skin Serum. 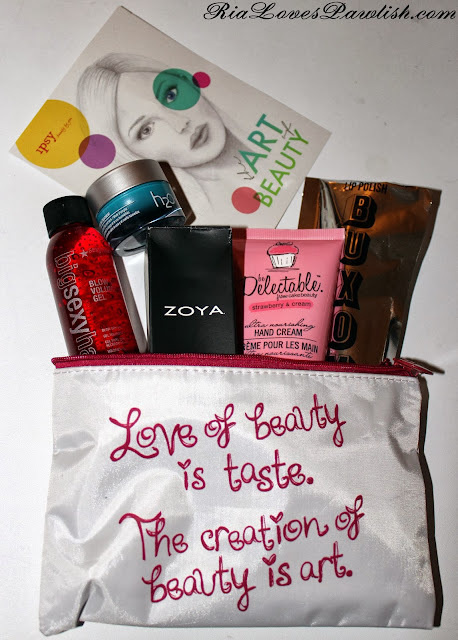 if you are interested in trying it, the little card says you can get 30% off with the coupon code LUXE. let me know if you give it a go and what you think! i generally don't try skincare because i'm pretty happy with what i'm using. and a close up look at the polishes! ran loads of errands today, including taking my muck boots to get them stretched... can't wait to get those babies back! i had also brought another pair of boots and several leather bags to get them conditioned and refreshed... sadly, the leather dude is on vacation so it will all have to wait a few weeks. i also checked a few places for some boots to replace the ones i had to send back owing to them being two different sizes... i think i found a cute pair of Ariat cowboy boots that are calling my name :) i also got some great thrift store stuff today, including a garment bag for three bucks... now i don't have to steal Mr. Pawlish's for horse shows! today's polish is Maybelline Color Show Dressed To Kill. this is the one i accidentally picked up thinking it was part of their Liquid Leather collection! it's a vampy oxblood type color... i can't decide if it's a red brown or a brown red :D it has a glossy creme finish, but i do recommend topcoat to dry it. the formula is scary on the first coats, but evens out perfectly on coat two! two coats Dressed To Kill, one coat Seche Vite. today's polish is Sally Hansen Xtreme Wear Blueberry Blast, a bright blue with a subtle shimmer. the formula scared me because i thought it was going to be terrible by its sheer, patchy first coat... happily, it became fully opaque on coat two! a coat of topcoat helps it dry, and also brings out the shimmer. two coats Blueberry Blast, one coat Seche Vite. 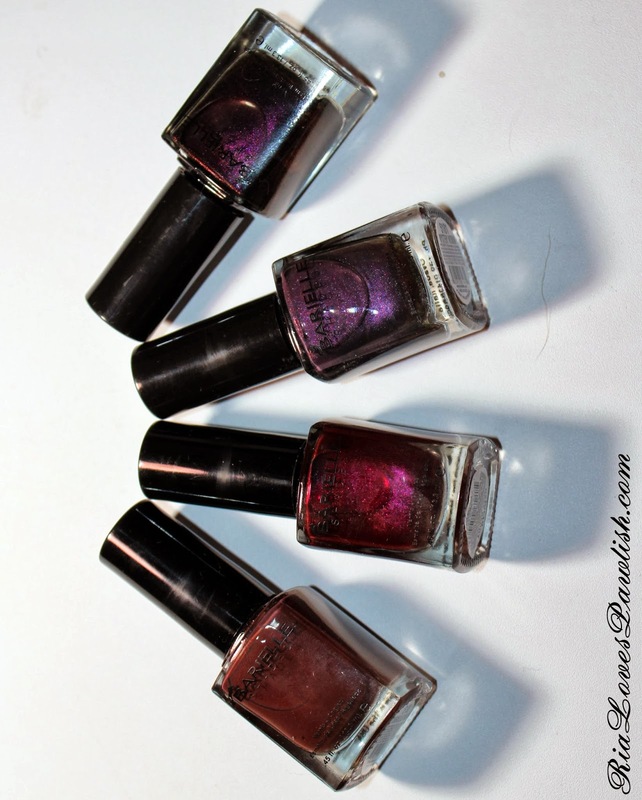 today i have a new press release from China Glaze to share with you all! this details their new holiday collection, Happy HoliGlaze. enjoy!! didn't make it out to the barn today, Mr. Pawlish had to go the doctor to get some things signed off on for our impending move! i just wish i could make time stop hurtling along... March gets closer and closer. the maintenance dude also came to fix the ice maker... which he failed at doing >.< guess i'll spend another day waiting around for them, i can't be gone when they come because the dogs would lose their marbles over some strange person coming in their house with no one else home! today i'd like to share the polishes i've picked up over the last few weeks. most things were on sale, and the Orlys i just couldn't resist! let's kick off with those Orly polishes... i just had to have the Matte FX collection, and the blue duochrome Angel Rain from their Surreal collection. i got a few Barielles from Marshalls, they originally came in a set of five but somebody had jacked one! so i got the remaining four for $5... the major selling point for me is that it had Lava Rock in it, which i've been jonesing for ever since passing it up last month! lastly, i found a bunch of Maybelline Color Show Liquid Leather polishes on sale at Rite Aid over the weekend. i had never tried those before and i'm still on the fence about them... looking forward to actually seeing them on my nails. i accidentally also bought a regular Color Show polish as it was clearanced out with the others... happily, it's a nice color and was only $1.99 so no regrets! 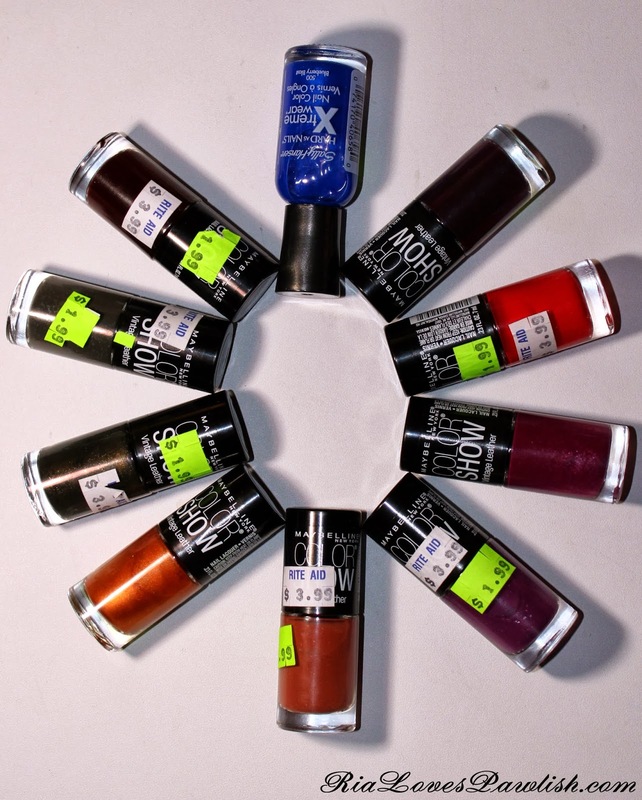 there is also a lone Sally Hansen polish that was such a gorgeous blue and only $1.49... how can you pass that up?! i'm super disappointed today... i got an email from the eBay seller i had bought my new boots from saying that they hadn't accidentally sent me one boot that was the wrong size. i had noticed that one boot felt larger, but i never thought to check if it was a different size! turns out, it was, so i have to send them back :( those are the ones i got an awesome deal on... i'm hoping to find another pair one day! i got my October ipsy Glam Bag over a week ago, but i had other things to share with you all first! but, today's the day :D this isn't my favorite bag and i'll probably give most of the products away... but for $10, it's worth the gamble. these next products seem nice, but i i'm set in my ways on my hair and face routine, and i don't really care to smell like strawberry... some friends will benefit from these! i can't believe the weekend is here already! somehow this week has really flown by for me. tomorrow i have my jump lesson, then i'm hitting the mall with Mr. Pawlish. i'm determined to find a good pair of jeggings! today's China Glaze Monsters Ball polish is Howl You Doin' (kindly provided to me for review!). it's a purple glitter in a blackened purple base... with the surprise addition of tiny orange flakies! application is really easy, it looks super patchy on the first coat but evens out to full opacity on coat two. i didn't have any problems with getting glitter to come out, and there is a large amount of orange flakes without any digging! i like this one to be really glossy, so i used two coats of China Glaze Fast Forward Top Coat (also provided for review!). two coats Howl You Doin', two coats Fast Forward Top Coat. 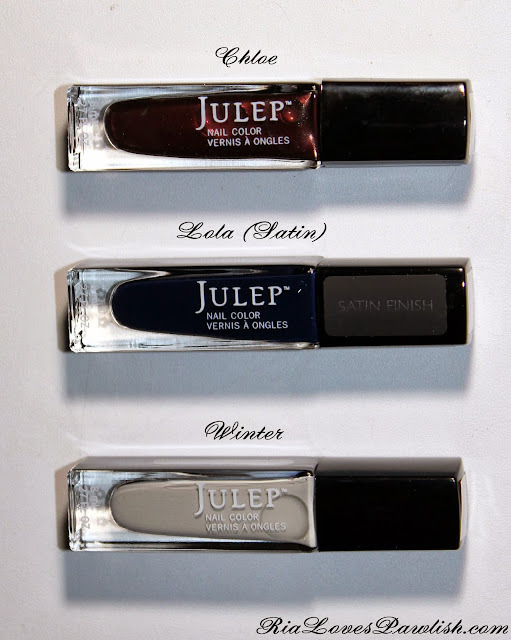 today we have the last of the new fall Pixi polishes (all three kindly provided to me for review!)... Deepest Dahlia. it's a darkest of plums creme that has a really rich tone. i love how vampy it is, almost black but not and much warmer which is quite flattering! it only needs two coats for full opacity and dries really glossy on its own, i just needed topcoat to help it dry. two coats Deepest Dahlia, one coat Seche Vite. Pixi products are available online at PixiBeauty.com and Target.com, as well as in Target stores! today's polish is Pixi Precious Pewter (kindly provided to me for review! ), another of their new fall colors. this polish is GORGEOUS. it's a golden silver foil that is full of multi-colored shimmers which give the polish tons of depth. it has great coverage, perfectly opaque in two coats, just be careful on application because it is a touch liquidy. a coat of topcoat helps it dry and brings out all those billions of shimmers! two coats Precious Pewter, one coat Seche Vite. 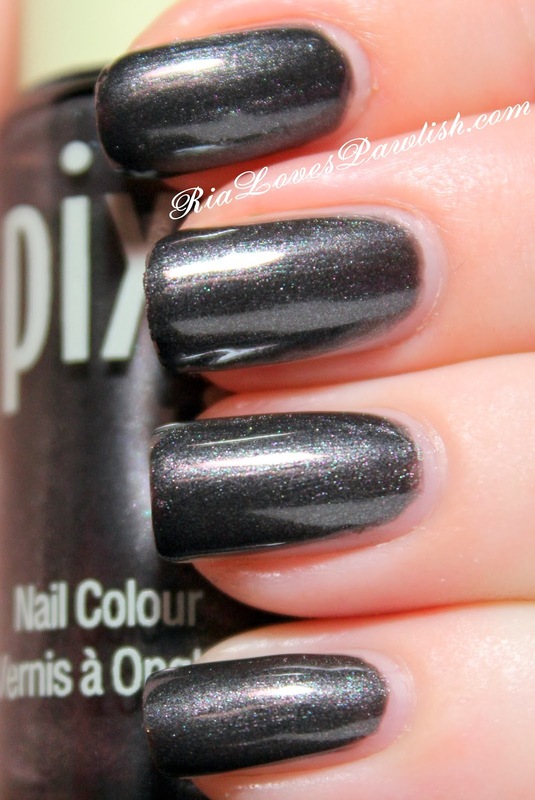 today's polish is Pixi Charcoal Celebration (kindly provided to me for review!). it's a lovely deep, steely greY pearl... with the great bonus of not having in your face brushstrokes! it's nice and opaque at one coat and looks absolutely perfect with two. adding a topcoat brings out all the shimmers and helps it dry! two coats Charcoal Celebration, one coat Seche Vite. busy, busy day today! went to the barn this morning, then headed over to the PX to do some shopping and have lunch... and after that groceries. i couldn't believe we already needed groceries, but apparently we eat a lot! i'm super happy because i won an eBay auction for a pair of boots i've been drooling over, can't wait to get them. today's manicure is what i chose for the Big Sur Jade Festival this weekend! if you live in Cali, check out the festival's website... it will definitely be fun. i meant to pick a green polish that had already been featured, but apparently Zoya Holly snuck into my 'used on the blog' chest of drawers without permission, sorry! 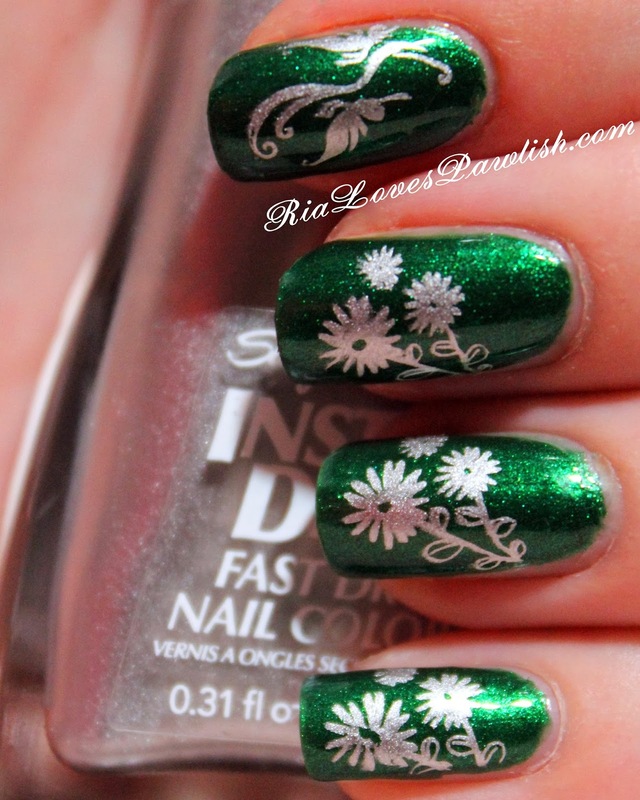 i will do a review on it by itself one of these days :) over Holly i used Sally Hansen Insta-Dri Silver Sweep with Konad plate m32... i love how easy Insta-Dri polishes are to work with when stamping! i used Poshe to help Holly dry, then again to seal in the whole design. today's polish is OPI Flit A Bit, a rich orange creme. love the color on this one, but the formula is obnoxious. it's super streaky on coat one, some patchiness on coat two... finally you get nice coverage on coat three, but the polish is just goopy. that could just be this bottle, though! it's dries nice and glossy on its own, but i definitely needed topcoat to help dry three coats of polish (four on some fingers!). three coats Flit A Bit, one coat Seche Vite.